The left navigation panel allows you to perform a number of activities for various sections in Livingtree. You can filter, create, and/or invite within all the sections that use the left navigation panel ('Conversations,' 'Calendar,' 'My Network'). To filter the activity in your current section, simply select the group you wish to view. Once selected, only the activity associated with that group will be shown. 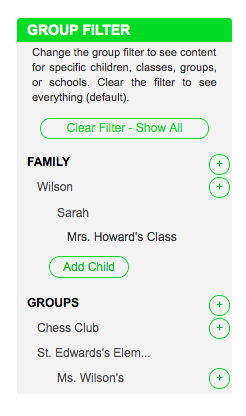 You can create a Family or Group by selecting the ‘+’ icon next to the respective category. You can invite members into the groups you've created by clicking the "+" icon next to the respective group, and entering the email addresses of the members you wish to invite. If you're an admin of a child-based group (class, team, etc. ), you can also invite using a unique code for your group.